CubeSats are tiny satellites built for specific purposes such as space imaging or technological testing. These nanosatellites are much smaller than conventional weather and communication satellites and are relatively easy to build and launch using off-the-shelf components. That ease of building and their inexpensive cost make for easy, cheap space access for students, small companies, and other institutions. 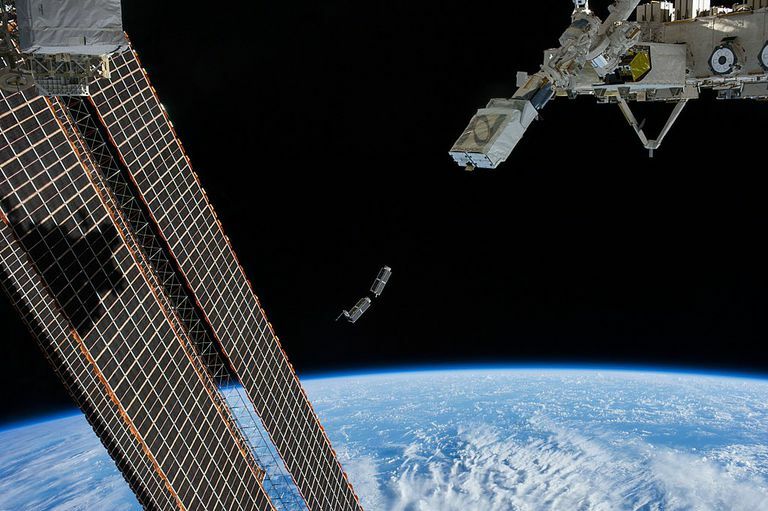 NASA developed CubeSats as part of a program to use nanosatellites for small research projects that could be planned and built by students, faculty, and small organizations not normally able to purchase launch time. They're primarily used by universities and smaller research institutes and companies. CubeSats are small and easy to launch. They're built to fit standard dimensions for easy integration into a launch vehicle. The smallest is 10 x 10 x 11 centimeters (referred to as 1U) and can be scaled up to be 6U in size. CubeSats typically weigh less than 3 pounds (1.33 kilograms) per unit. The largest ones, the 6U satellites, are around 26.5 pounds (12 to 14 kilograms). The mass of each CubeSat depends on the instruments it holds and the launch method needed. CubeSats are expected to maneuver on their own during their missions and carry their own miniaturized instruments and computers. They communicate their data back to Earth, to be picked up by NASA and other ground stations. They use solar cells for power, with onboard battery storage. The cost for CubeSats is relatively small, with construction costs starting around $40,000-$50,000. Launch costs are dipping below $100,000 per sat, particularly when a number of them can be sent to space on a single launch platform. In recent years, some launches have lofted dozens of CubeSats to space at a single go. In December of 2013, students at Thomas Jefferson High School for Science and Technology in Alexandria, Virginia, built the first-ever small satellite of its kind using parts of a smartphone. Their little satellite, called a "PhoneSat," was first conceived by NASA as a way to test nanosatellites equipped with smartphone technology. Since that time, numerous other CubeSats have flown. Many have been designed and built by college students and small institutions interested in gaining access to space for educational and science activities. They've been an excellent way for students to learn to build and manage science projects, and for universities and others to participate in experiments in space with small-scale explorers. In all cases, the development groups work with NASA to plan their missions, and then apply for launch time, just as any other client would. Each year, NASA announces CubeSat opportunities for a variety of technical and scientific projects. Since 2003, hundreds of these mini-satellites have been launched, providing science data for everything from amateur radio and telecommunications to Earth science, planetary sciences, atmospheric science and climate change, biology, and technology testing. Many more CubeSat projects are in development, covering investigations in reconnaissance, biology, continued atmospheric studies, and testing materials for use in future spacecraft. CubeSats have been launched by the Russian Space Agency, the European Space Agency, the Indian Space Research Organization (ISRO) and NASA, among others. They've also been deployed from the International Space Station. Along with imaging and other technology demonstrations, CubeSats have deployed solar sail technology, x-ray astronomy instruments, and other payloads. On February 15, 2017, the ISRO made history when it deployed 104 nanosatellites aboard a single rocket. Those experiments represented the work of students and scientists from the US, Israel, Kazakhstan, Switzerland, the United Arab Emirates, and Switzerland. The CubeSat program is a simple and cost-effective way to reach space. Future nanosatellites in the series will focus on measurements of Earth's atmosphere, continue student access to space, and in a first — with the MarCO CubeSats — will deploy two of these mini-satellites at Mars with the InSight Mission. Along with NASA, the European Space Agency continues to invite students to submit CubeSat plans for possible launch in the future, training even more young women and men to become future spacecraft engineers!